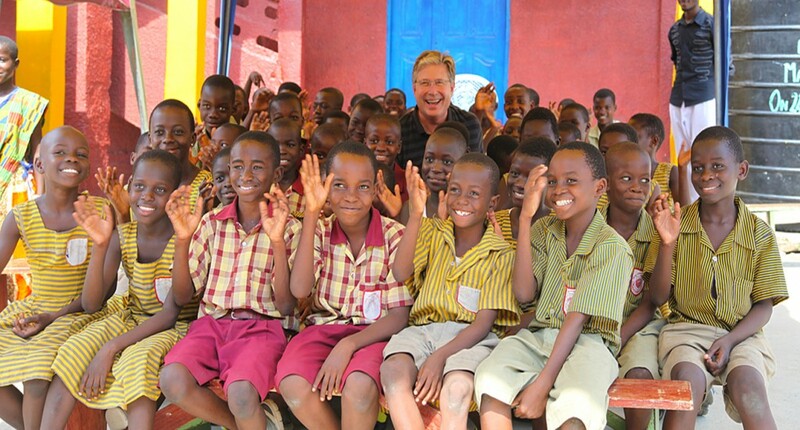 Don Moen with children of Royal Seed School. When our children were young, Laura and I strongly believed in the importance of education. We wanted our kids to be in a school where they succeeded academically, had appropriate school supplies to learn, and where they grew in the Lord. I still believe in Christian education today, especially for kids born into a cycle of poverty. Without a Christ-centered education, many kids around the world face a lifetime of hardship and limitations. Royal Seed is a ministry in Ghana that Worship In Action partners have supported for several years. This ministry provides food, clothing, shelter and an education to approximately 200 orphan children. Royal Seed also provides a free Christian education to 300+ additional children who live in communities near the home, and who travel to/from school every day. These children come from impoverished families who can’t afford to pay school fees. Without Royal Seed, it is unlikely many of these children would ever go to school. We are excited to announce that over the summer months Worship In Action is sponsoring a new School Supply program to provide backpacks, school supplies, uniforms and teacher assistance for the kids of Royal Seed School in Ghana. Donations given to this new school program will meet very practical and life-long needs for hundreds of children. A donation of $25 will purchase a backpack, pencils, erasers, and writing notebooks for one student. A gift of $50 will provide a backpack, supplies and a new school uniform. To make a donation, please click here or on the donate button below. And, watch our Facebook page for updates on this exciting program. Thank you for joining us.